Got an email this morning from an old friend, saying they were happy as heck to be coming my way soon and staying in the near-by town of Canton. And why not? Check out the marketing for this apparently lovely little mountain enclave. The reality? 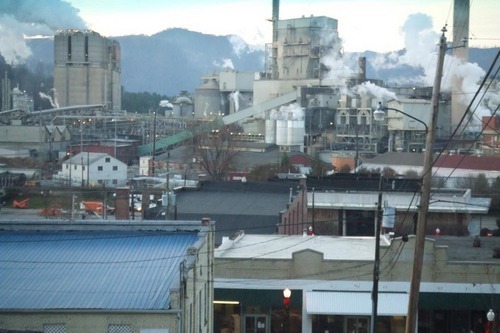 Canton is home to one of North Carolina's largest and most productive paper mills, Blue Ridge Paper. Ever been around paper being made? Not only does it smell REALLY bad for miles in every direction, the pollution output (even though they have dropped in recent yers) for old mills such as Canton's are the stuff of environmentally challenged legend. Ha! In the early 70's a boyfriend and I hitched down to Tuscaloosa, Alabama, so he could go to college there. I got a job waitressing at a Big Boys or Shoneys or something like that. I worked a night shift, and had to hitch home, since I didn't know how to drive; I still don't, but I'm thinking I should learn. But that's gonna be hard in NYC, with no car to practice. Anyway, I remember standing on the highway with my thumb out every night, and this big orange cloud of stink rolling down the road from the nearby papermill. It was a terrible smell, and it felt like it burned my face. I moved back to NYC after six months. Yeah, I know the smell of pulp: Tacoma, Washington, just south of Seattle. The town has come up over the years, though, I must say...though the smell as the same as it ever was. If Zina stayed in Alabama her paintings would be Overlooked Alabamians! Just doesn't have the same ring.